Commercial Popcorn Machines for Home and Business Use. Commercial Popcorn Machines are our specialty here at Standard Concession Supply. Everyone loves popcorn! It's very nutritional and it tastes great! Popcorn is a great fun food to snack while watching your favorite movie, socializing at a party, playing your favorite board game, or for snacking while watching your favorite sports team. Today, fresh and hot movie theater style popcorn can be easily and quickly made with the variety of commercial popcorn poppers available on the market for home and commercial use. Whether you are looking for a home theater popcorn machine to upgrade and enhance your home theater room, or you are looking for the correct popcorn machine for equipping your concession area, or if you are looking to purchase a popcorn popper as a gift, here at Standard Concession Supply we can help you find the right popcorn machine. Look over our large variety of commercial popcorn machines and find one that matches your needs. If you need any assistance on which popcorn popper is right for you, feel free to email Mark at funfoods@cox.net or call 757-473-8951. If you would like order a popper by telephone, you can call this number as well. 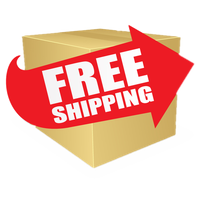 Your order will be shipped within one to three business days after ordering. Shipping charges are calculated when you check-out your order. We can ship internationally. Please email us with your model number and name for further information on international orders. If no shipping charges appear with your order for the larger popcorn machines, please call 757-473-8951 to place your order or for a shipping charge quote. At the bottom of this page, there is an instructional video on how to pop popcorn in a Benchmark USA Popcorn Machine and Paragon Popcorn Machine. Benchmark USA Premiere Cinema Style 4 oz. Popcorn Machine. Economically priced to fit any one's budget, but yet classy to fit into any game room or home theater, or in a small office setting. Great starter commercial popcorn machine. Bring the movie theater experience right into your own home or office with the Premiere Hollywood Style Popcorn Popper! This is a 4 oz. popcorn machine. The user-friendly design of these poppers allows for in-field repairs to be made easily with standard household tools. 3 Year parts warranty. Let's go to movies with the this Premiere Pedestal Popcorn Machine Base. The optional pedestal base, pictured with the premiere popcorn machine, has a two shelf storage compartment for all of your popcorn supplies. This Hollywood popcorn pedestal base will be a great compliment to your Premiere Popcorn Machine especially in a home theater setting. Unique and eye catching take 2 Movie production graphics featured on this popcorn pedestal. Premiere popcorn machine is not included with this offer, but can be purchased separately through above link. Cineplex Yellow 4 oz Popcorn Machine. ThisParagon Popcorn Machine is designed for use in today's home theater and gaming rooms, and is the perfect combination of quality and convenience found in Paragon's made in America popcorn machines. Designed with the end-user in mind, the cord is in the back, while the graphics and door in front. And the popcorn machine features a textured yellow color featuring a pitted, powder coat material treatment that is all the rage in high-end home accents. Built in warming deck and old maid drawer and presentation lamp. Limited life time warranty for home use. Three year warranty for non-residential use. Made in the USA. Paragon has introduced a new value-line of popcorn machines. Standard Concession Supply features here the Paragon Thrifty Pop 4 oz. Popcorn Machine. Made in the USA! If you have been waiting to buy a Paragon Popcorn Machine at the right price, now is your time! Great starter popcorn machine for the home. Great popcorn machine for those on a budget. High output. Tempered glass panels. Looking for a stylish home popcorn machine with a budget in mind, check out the the Paragon Manufactured Fun newest Popcorn Machine...The 4 oz. Gatsby Popcorn Machine in our home theater popper section...The lowest priced 4 oz. popcorn machine found anywhere in the market that is made in the USA. Add a popcorn stand to your Paragon Thrifty Pop 4 oz Popccorn Machine. Popcorn machine is not included. Popcorn Machine can be purchased seperately above. Just like the good old days, you can showcase your good taste in your home theater, home entertainment room, or office area in style with our beautiful, top-quality, authentic, antique replica 4oz. Street Vendor Popcorn Machine. You will receive many compliments with this very fine stylish popcorn machine. Besides the great ascetics, this old fashioned style commercial quality Benchmark popcorn machine makes great tasting, movie style popcorn. Pops 85 quarts of popcorn per hour. The kettle is constructed of thick gauge anodized aluminum for maximized performance and easy cleaning. Has a heated warming deck to keep your popcorn warm and fresh tasting! This is a 4 oz popcorn machine. Add mobility and good looks to your Street Vendor Popcorn Machine with this very stylish Antique Popcorn Trolley-Cart. Complete the nostalgic look for your Street Vendor 4, 6, or 8 oz Popcorn Machine with this popcorn cart to compliment your home theater, home game room, office, bar, hotel lobby, or nursing home. Storage area to keep your popcorn supplies and scissors is included. Popcorn Machine is not included with cart, but can be purchased separately by clicking on the link above. This popcorn cart holds all the Benchmark Street Vendor Popcorn Machines including the 4, 6, and 8 oz popcorn machines. Super graded Commercial Popcorn Machine from Paragon. It's the Paragon Theatre Pop 4 Popcorn Machine! This full-featured popcorn machine is ideal as a home theatre popcorn machine or game room popcorn machine, but also functions great as a commercial popcorn machine for retail stores or small bars. The Theatre Pop 4 Popcorn Machine is economical, easy to clean, easy to operate, and produces delicious, theatre-quality popcorn in minutes. And you can get our 4 oz pre-measured theatre popcorn in our popcorn supplies store. Healthy snack and provides great family fun and entertainment. And if you use it in your office or bar, you have a great customer or employee snack for munchies time! Compact design 16" wide by 14" deep- is ideal for small spaces and makes a great countertop popcorn machine. Lifetime Warranty on this made in the USA Popcorn Machine when used for residential purposes. 3 Year warranty for business use. Bonus: 1 Sample Pack of 4 oz 3 Count Pre-Measured Weaver Portion Pack Popcorn and 25 1 oz Popcorn Bags with the Purchase of the TP-4 Popcorn Machine Free! Includes Popcorn, Oil, and Salt. Put your popcorn machine on a cart for great mobility and easier access. This cart is for the Paragon 1911 antique style and theatre pop 4 oz. popcorn machines. Wheel size on the cart is 16". Bright red frame with yellow graphics. No need to go to the movie theater to get theater quality popcorn when you can have the Paragon TP-4 oz Theater Style Popcorn Machine and Cart Combo right in own home theater room. This combo is less than $650.00...great deal on a very quality popcorn machine with a lifetime warranty when used for residential purposes! No need to worry about future part costs. Short, 3 minute cycle produces 92 ounces of popcorn per hour. Great Holiday gift or home theater popcorn machine. JR4 Mini JetStar Popcorn Popper. This 4 oz. Popcorn Machine can be placed in small kiosks, coffee shops, small business lobbies, break areas, rental facilities and other small foodservice operations. Our 4 oz. popper is perfect for your home theatre, office, recreation room, kitchen or wherever you might want to pop and dispense popcorn. Small enough to place anmost anywhere! Less than 30 lbs.! You decide! This American made Popcorn Machine is quality number one. Nicely designed and very sturdy and made to last for many years. Impress and delight your freinds and family with this beautiful antique style popcorn machine. The Paragon 1911 Original 4 Ounce Popcorn Machine will pop a full cycle of popcorn every 3 minutes. Optional Popcorn Cart can be purchased seperately. See below for details. This popcorn machine will be a great addition for any home theatre or gameroom. Make popcorn just like the movie theaters! Create a wonderful aroma and enjoy great tasting popcorn with our pre measured 4oz. packets of movie theater style popcorn, oil, and buttery flavored salt-found in our popcorn supplies section. Lifetime Warranty on this 4 oz. popcorn popper for residential use.! 3 Year warranty for business use. Paragon antique style 1911 4 oz popcorn machine and cart combo. Great home theater set-up popcorn machine combo. Also great for car dealership lobby area, small nursing home, or similar locations. This American made Popcorn Machine is quality number one. Nicely designed and very sturdy and made to last for many years. Impress and delight your Friends and family with this beautiful antique style popcorn machine. The Paragon 1911 Original 4 Ounce Popcorn Machine will pop a full cycle of popcorn every 3 minutes. This popcorn machine and cart will be a great addition for any home theater or game room. Make popcorn just like the movie theaters! Bonus: 1 Starter Case of 4 oz 24 Count Pre-Measured Portion Pack Popcorn with the Purchase of the 1911-4 Popcorn Machine and Cart Free! Includes Popcorn, Oil, and Salt. Pops up about 100 1 oz bags of popped popcorn. New ...The Paragon Original 1911 4 oz. Popcorn Machine now comes in the colors of black and chrome in addition to the classical red color! Classly New Colors for the Paragon 1911 4 oz. Popcorn Machine. Nostalgia combined with new technology. Reminiscent of the popcorn machines used by American street vendors almost 100 years ago. If your home theater decor begs for a new look and feel, then maybe the Paragon Black and Chriome Popcorn Popcorn Machine is for you. Great popper for a small office or waiting room area as well. Pops 92 one ounce servings per hour. Paragon Contempo 4 oz. Popcorn Machine. Sleek and sophisticated Popcorn Machine from Paragon. Pops 92 oz. of popcorn per hour. The life of the party! Our streamlined Contempo Pop machines have a modern look well suited for many businesses, clubs, bars and homes. The gloss black cabinet has clean, bold graphics and smoked glass side panels. This Paragon 4 oz. Contempo Popcorn Machine is a full-featured machine and is easy to use and easy to maintain. Elegant and sophisticated for any home theater. Life time warranty on this American made Paragon Contempo Pop 4 oz. Popcorn Machine! Paragon Pocorn Cart for the 4 oz. Contempo Pop Pocorn Machine. The dimensions are 16" X 34" X 30". Great for mobility and storage of supplies. This popcorn cart also enhances the visual aesthetic quality of the popcorn machine. Gloss black frame and slver graphics. Harley Davidson 4 oz Popcorn Machine. This one is for all your Harley Davidson Lovers. Black and silver chrome. Manufacutured by Paragon. Pops 92 one-ounce servings per hour. Has built in warming deck, tempered glass panels, and seed tray. Special Note: The Harley Davidson Design featured here is no longer available. If you order this 4 oz Popcorn Machine by itself, it will look like the Harley Davidson Popcorn Machine featured on the cart below. You can click on the link below with the machine and cart combo, and click on the link under the photo for a larger view of the popcorn machine and cart combo. Harley Davidson 4 oz Popcorn Machine and cart combo. Black and silver chrome. Manufactured by Paragon. Pops 92 one-ounce servings per hour. Has built in warming deck, tempered glass panels, and seed tray. This combo features the Harley Davidson Popcorn Cart adding versatility and mobility for your Harley Davidson Popcorn Machine. Hey VA Tech Hokies Fans...We now have something special for you...A Four Oz. Theater Style Popcorn Machine and Matching Cart featuring the VA Tech University Logo. Featuring the beautiful school colors of moroon and orange with silver lettering and featuring the famous VATechTurkey. Show pride in your school and the VA Tech Football and Basketball teams as well as all the other Hokie team sports! Three year warranty and made in the USA. Virginia Tech Hokies Popcorn Machine Only. This item is the popcorn machine only. If you want the popcorn machine and cart combo, click on the link above. Popcorn Cart is sold seperately. Premiere 6 oz Hollywood Popcorn Popper by Benchmark USA. A great seller at Standard Concession Supply...A great popcorn machine for commercial snack bars, high school football concession area, little league baseball, nursing homes, hotel or car dealership lobby areas. Also, great compliment to a larger home theater. Pops delicious movie style popcorn in 3-5 minutes. Commercial grade. Let's go to movies with the this Benchmark USA 6 oz Premiere Popcorn Machine and Pedestal Base. Great popcorn machine for a larger home theater and for larger home parties. For a real hungry popcorn eating crowd! Also great for small businesses especially with a lobby waiting area for customers. Also super for video stores. The pedestal base, pictured with the premiere popcorn machine, has a two shelf storage compartment for all of your popcorn supplies. This Hollywood popcorn pedestal base exceptionally compliments this Premiere 6 oz. Popcorn Machine especially in a home theater setting. Unique and eye catching take 2 Movie production graphics featured on this popcorn machine and pedestal. Bonus: With the purchase of this Hollywood Pemiere Popcorn Machine, you will receive a Free Sample pack that includes (3) 4 oz pre-measured popcorn packs including popcorn, oil, and buttery flavored salt. Bonus also includes 25 one ounce popcorn bags! Benchmark USA Metropolitan 6 oz Popcorn Machine. This popcorn machine is ideal for home theaters. Its unique design enables it to be placed against a wall for a minimal space requirement while still providing an attractive visual impact. Ordinary popcorn machines have the graphics and cosmetic appeal on the back of the popper making them unsuitable for wall placement. The design of the Metropolitan Popcorn Machine is developed from the art deco architecture of the late 1920’s and 1930’s. Great popcorn machine also for nursing homes, recreation areas, and in certain cafe settings. This nostalgic style popcorn machines comes with an options base pedestal. Bonus: With the purchase of this Metropolitan Popcorn Machine, you will receive a Free Sample pack that includes (3) 8 oz pre-measured popcorn packs including popcorn, oil, and buttery flavored salt. Bonus also includes 25 one ounce popcorn bags! Benchmark USA Metropolitan 6 oz Kettle Home Theater Popcorn Machine and Pedestal Base Combo. This popcorn machine featured with our metropolitan popcorn machine pedestal has a larger kettle than the 4 oz Metropolitan Popper featured in our home theater section. This six ounce kettle can pop an extra 2-3 ounces of popcorn every three minutes, or a total of 6-8 ounces of raw popcorn. This machine pops a bigger quantity quicker as well as puts less stress on you popcorn machine as you do not have to pop popcorn as many times to acquire the same amount of desired popcorn. Grab one today for all your parties and home movie nights. Impress all your festive invites with this Home Theater Metropolitan Popcorn Machine! Great price at only $674.98! Benchmark USA Street Vendor 6 oz Popcorn Machine. Classy antique style 6 oz popcorn machine that can be used a counter-top popcorn machine or with an optional matching trolley cart. This commercial popcorn machine can be used for home or business. This Street Vendor popper feature a stainless steel food-zone, 20 mil anodized kettle (for easy cleaning), heated warming deck, old-maid drawer (for un-popped kernels), tempered glass panel and an industry longest three year parts warranty. The popcorn kettle inners are constructed of thick gauge anodized aluminum for maximum performance and easy cleaning. Aluminum provides the best heat transfer of any “cookware approved” alloy while the 20 mil thick anodizing armors the kettle for durability and provides a super-slick surface for easy cleaning. The kettle jackets are made from stainless steel for corrosion resistance and easy cleaning. Great priced 6 oz. popcorn machine! The Paragon Theatre Pop 6 is great commercial popcorn machine, but can function nicely as a home popcorn machine as well. The Theater Pop 6 Popcorn Machine is ideal for use in festival vendors, business lobby or waiting areas, country clubs, restaurants, video stores and cafeterias, small school booster club snack bars, or home game room. This popcorn machine is also great for rental stores. It is easy to carry and relocate for one person. Why rent out those big and clumbsy yellow top popcorn machines that takes two people to carry out, when you can rent out this 6 oz popcorn machine that takes only one person to carry out! No more aching backs! It produces 113 one-ounce servings per hour. This popcorn machine has a heated warming deck and heat lamp to keep the popcorn always fresh!! This Paragon Theatre Pop 6 popcorn machine has a six-ounce kettle that pops a full cycle every 3 minutes. Paragon 1911-6 Popcorn Machine. This popcorn machine is for those who want a popcorn machine with a six ounce kettle capacity, but also with the nostalgic style and look of years gone by. Has all the great features that all that all the Paragon Popcorn Machines have including a warranty on some parts up to three Years! This popcorn machine pops 113 one-ounce servings per hour. Space saver design fits in small areas. But this popcorn machine can make a lot delicious popcorn, as well as produce that wonderful aroma that you smell while at a movie theater. Red Popcorn Cart that fits the Regular and Antique 6 oz. or 8 oz. Popcorn Machines. Yellow spoked wheels. This great looking cart makes moving the popcorn machine around easy and simple, as well as, displays the machine in a very attractive manner. Wheel size on this cart is 24". The cart adds to the nostalgic look and feel. Popcorn Machine not included. For visual purposes only. Paragon Professional Series Stainless Steel 6 oz Popcorn Machine. The newest innovation that has come down from Paragon Manufactured Fun is the Professional Series Stainless Steel Popcorn Machine. Using the Theater Pop Popcorn Machine design, they replaced all painted parts with commercial gage steel and add Lighted switches to provide improved ease-of-use, and being able to see all the correct switches under darkened conditions. Finally simple, functional labeling was used, highlighted by stainless steel signature-style model labels. Rusting of the kettle and machine is eliminated. The result is a durable, attractive machine that will complement many home and office environments or offer commercial users the best in long-term durability. Great machine for social clubs, video stores, break area, restaurants, small bars, and country clubs. If you are interested in a 4 oz. Professional Series Stainless Steel Popcorn Machine with or without Stand, head over to our Home Theater Popcorn Machines section. Popcorn Cart for the Paragon Professional Series 6 oz Popcorn Machine. This cart which fits the 6 oz. Professional Series Popcorn Machine(listed above) provides easier access, better merchandising and great mobility. The sturdy all steel construction has a chip resistant coating. Also features convenient built-in storage space and breaks down easily for storage and transportation. Limiting labeling to a simple stainless steel signature style plate carries the classic design through out the entire unit. This design results in a classic, elegant look that will enhance the most up-scale room, while maintaining the same high-end commercial concession environments. Paragon CP-8oz Popcorn Machine has brought modern features and convenience together to make one of the best 8-ounce poppers on the market. The streamlined Contempo 8 has the contemporary look suited for many homes and especially home theaters, but also for many businesses, clubs and bars. The gloss black cabinet has clean, bold graphics, smoked glass side panels and a clear door. New at Standard Concession Supply are the Star Manufacturer Jetstar 6 oz capacity popcorn machines. Precision engineering makes the 6 Oz. Jetstar line of popcorn machines the perfect solution when space or budget constraints prevents using a larger popcorn machine. The six once JetStar can handle 8 oz of popcorn with excellent results. What is the secret? The kettle is like the larger Star Galaxy Kettle. This popcorn machine produces 135 one ounce servings of popcorn per hour. The JetStar 39R-A Red and Gold Antique Style 6 oz popcorn machine is great for snack bars, convenience stores, taverns, restaurants, little leagues baseball, and other youth sporting venues. The 6 oz. JetStar popcorn machines are built to last and will provide popcorn profitability year after year. Extremely strong, durable cabinets feature rugged corner posts and shatterproof tempered glass panels. High product visibility and bright colorful graphics provide outstanding merchandising opportunities. The JetStar 39D-A Wood Grain Top 6 oz popcorn machine is great for snack bars, convenience stores, taverns, restaurants, little leagues baseball, and other youth sporting venues. The 6 oz. JetStar popcorn machines are built to last and will provide popcorn profitability year after year. Extremely strong, durable cabinets feature rugged corner posts and shatterproof tempered glass panels. High product visibility and bright colorful graphics provide outstanding merchandising opportunities. 21-1/2" counter space required. Paragon has just introduced a new value-line of popcorn machines. Standard Concession Supply features here the Paragon Thrifty Pop 8 oz. Popcorn Machine. Made in the USA! Wow what in introductory price...ONLY $379.00. If you have been waiting to buy a 8 oz. popcorn machine at the right price, now is your time! Great starter popcorn machine for the home or business. Great popcorn machine for those on a budget. High output Hard-Coat Anodized Kettle. Tempered glass panels. Pops 147 one-ounce servings per hour. Number one size for commercial use. This 8 oz. Street Vendor Antique Popcorn Machine, manufactured by Benchmark USA, is reminiscent of the Popcorn Machines seen on the boardwalks of Coney Island and Palisades Park of days gone by. These antique styled popcorn machines will remind you of an era when vendors sold popcorn on street corners all across America. Sure to create a fun and friendly atmosphere in any location, these commercial quality machines are available as a counter-top model or with the matching trolley. All of the Street Vendor poppers feature stainless steel food-zones, 20 mil anodized kettles (for easy cleaning), heated warming decks, old-maid drawers (for un-popped kernels), tempered glass panels and an industry longest three year parts warranty. Benchmark USA 8 oz Street Vendor Popcorn Machine and Cart Combo. Grab this combo today at this great price. This popcorn machine includes all the great features listed above including stainless steel food-zones, 20 mil anodized kettles (for easy cleaning), heated warming decks, old-maid drawers (for un-popped kernels), tempered glass panels and an industry longest three year parts warranty. And for great mobility, easy access, storage, and for astectics, this price includes a cart to support your street vendor popcorn machine. 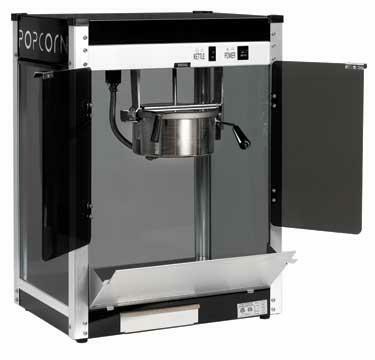 The Paragon Theater Pop 8 commercial popcorn machine is a great popper for schools. This commercial popcorn machine produces 147 one-ounce servings per hour. This 8 ounce popper is ideal for PTA's, schools, outdoor football/soccer/baseball little-league concession stands, convenience stores, bars, hotels, community clubs, and skating rinks. Has heated warming deck and bulb to keep the popcorn always fresh! 3 Year warranty program. Produces 147 one-ounce servings per hour. Great for when serving more than 25 people. Made in the USA. The Original Paragon 1911 8 Ounce Antique style Commercial Popcorn Machine is ideal for schools, bars, hotels, offices, dealerships, and retail stores. This popcorn machine is also great for rental stores. It is easy to carry and relocate for one person. Why rent out those big and clumsy yellow top popcorn machines that takes two people to carry out, when you can rent out this 8 oz popcorn machine that takes only one person to carry out! No more aching backs! Features both a warming deck to keep the popcorn hot all day and an old maids tray for easy cleaning. Pops 147 one-ounce servings per hour. Number 1 seller for Commercial Popcorn Machines. Popcorn is very nutritious with lots of vitamins and fiber, and studies have shown that it may prevent Type 2 diabetes. This popcorn machine has a heated warming deck and heat lamp to always keep the popcorn fresh!! The corn popping creates a wonderful aroma! Combo 1911 Black and Chrome Paragon Popcorn Machine and Cart. 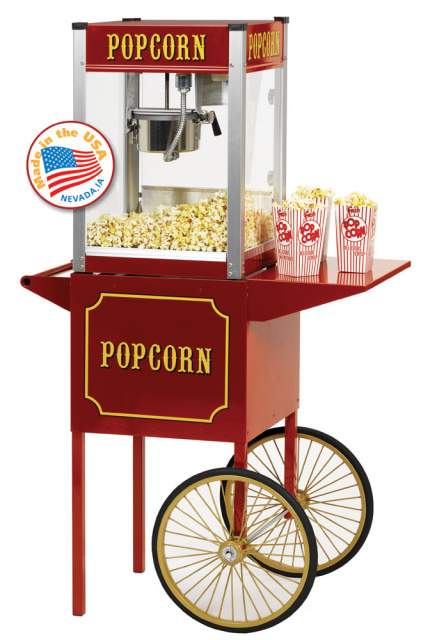 With this popcorn machine and spoke wheel cart, you add versatility and design to your home theater or game room. For business use, carts provide easier access, better merchandising and great mobility. The cart also provides a section to store all your popcorn supplies. The popcorn machine features an 8 oz kettle like the 1911 popcorn machine listed above. Benchmark's USA Silver Screen 8 oz. Popcorn Machine is their most most technically advanced model. This 8 oz popcorn machine incorporates a separate cabinet thermostat and temperature indicator. This Benchmark USA innovation allows you to accurately control the heat in the food zone ensuring that your popcorn is always at the perfect serving temperature. Each Silver Screen model has a stainless steel cabinet and food zone insuring years of durability. Great popcorn machine for high schools, conventions halls, car dealerships, concession stands, bowling alleys, home theaters, and more. Click on above link for more info. Benchmark USA Silver Screen 8 oz. Popcorn Machine with Pedestal Base. Great for college or high school snack bars, football concession areas, fundraisers, and more. One of the most technically advance popcorn machines on the market. Click on the above link to see a picture of the advance control panel. New....The Rent A Pop Popcorn Machine made by Paragon International. This 8 oz Popcorn Machine is one of the toughest and strongest made popcorn machines you will find anywhere. That is why is it is great popcorn popper for rental stores where you will have a lot of moving about and around with the machine. Also great for anyone just looking for a very durable popcorn machine. Paragon describe this popper as a portable and indestructible unit. Never worry about glass breaking. Moving this popper around is easier as it includes snap flat handles. Makes fresh and delicious popcorn in 3 to 5 minutes. Gold Medal #2252 Pop Maxx Popcorn Machine. The Pop Maxx is a great popcorn machine that will meet your need for popping popcorn for larger crowds. The Pop Maxx features an EZ Kleen Kettle. The Kettle is listed as a 12/14 oz. popcorn kettle. The Pop Maxx is the most popular popcorn machine for its size! Maximum pop out from a 15 amp line! Ample working space, operator safety, stainless steel cabinet. It's a go anywhere money maker! Grab one today! Great popcorn machine for schools and football concession stands. The Paragon TP-12 Popcorn Machine is ideal for venues that draw bigger crowds such as schools, race tracks, zoos, carnival midways, and coliseums. This popcorn machine will definitely satisfy a lot of popcorn eaters quickly. And this popcorn machine operates on a 15 amp circuit, so it can be used as mobile unit since it does not need a dedicated circuit. Grab one today...You will no longer have long lines of customers waiting for a bag or box of popcorn! Large Popcorn Machine Cart to Fit either the Paragon 12 oz. Popcorn Machine listed above or the 16 oz. Popcorn Machine listed just below. These popcorn carts always provide greater mobility, versatility, and greater merchandising. Adding a popcorn cart to your popcorn machine will be more eye catching as people pass your stand. Great amount storage space available as well to hold your popcorn supplies to make things more neat and organized. Breaks down easily for storage and transportation. Commercial 14 oz. Classic Pop Popcorn Machine. Styled just like the popcorn machines you see at the local movie theater. And, this popcorn machine is priced very competively to help your business bottom line. This Classic Pop Popper has a bright cabinet and classic graphics that will fit almost any decor. This 14 oz. popcorn machine pops 240 one-ounce servings per hour or 14 one oz. bags per popping. This high volume machine is ideal for larger venues including: convention centers, arenas, amusement parks, and smaller style movie theaters or theater production venues. This Paragon American-made Classic Pop popcorn machine is unparalleled in quality and workmanship and is comparable to commercial popcorn machines you find at the movie theaters. If you are looking for the highest quality popcorn machine in the market, you will find it in the Classic Pop. Paragon Classic Pop 14 oz. Popcorn Machine and Cart Combo. All the features listed above for the Classic Pop 14 are same for this popcorn machine. In addition, this popper is featured with a matching attractive two wheel cart that will enhance mobility, sales and merchandising, as well as easier access. The cart features a sturdy.all steel construction that has a chip resistant coating. Also features convenient built-in storage space and breaks down easily for storage and transportation. Popcorn Stand for CLP-14 Classic 14 oz Popcorn Machine. This red classy looking stand has a stainless top and and is constructed with commercial grade steel. Less floor-space requirement than carts with wheels. The Benchmark's USA Silver Screen 14 oz. Popcorn Machine is their most most technically advanced model. This 14 oz popcorn machine incorporates a separate cabinet thermostat and temperature indicator. This Benchmark USA innovation allows you to accurately control the heat in the food zone ensuring that your popcorn is always at the perfect serving temperature. Each Silver Screen model has a stainless steel cabinet and food zone insuring years of durability. The Benchmark 14 oz. Silver Screen Popper utilizes a hard-coat anodized, high Thermal Mass Kettle for easy cleaning and superior performance. The four-switch configuration allows for any operating situation. The 14 oz is designed with space saving in mind. This model will work on a standard 15 amp circuit so that it can be used anywhere without any additional electrical wiring. Optional stainless steel pedestal bases with heavy-duty casters and storage capabilities is available. 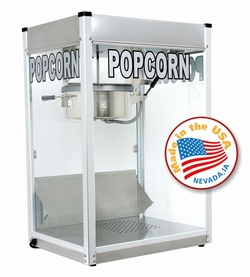 For shipping cost, call 757-473-8951 on this 14 oz Silver Screen Popcorn Machine. Paragon's American-made Classic Pop popcorn machines are unparalleled in quality and workmanship and are comparable to commercial popcorn machines you find at the movie theaters. If you are looking for the highest quality popcorn machine in the market, you will find it in the Classic Pop. This machine is ideal to use in schools or any environment that needs lots of popcorn. Great for high school or college football stadiums. Also great for amuesement parks and arenas/convention centers. This popper will produce 300 servings per hour. EXTRA BONUS: 1 PORTION PACK KIT - 20 CT POPCORN PACKS FOR 16 OZ KETTLE WITH PURCHASE OF THE CLASSIC 16 OZ POPCORN MACHINE. INCLUDES PRE-MEASURED POPCORN, OIL, AND POPCORN SEASONED SALT. Paragon CLP-20 Popcorn Machine. Large Movie Theater size Popcorn Machine from Paragon with Free Shipping! Besides Movie Theaters use, this very high-volume machine is ideal for larger venues including convention centers, arenas and amusement parks. The Classic Pop 20 has a bright and classic graphics that fit almost any decor. This full-featured 20 oz popcorn machine pops delicious, theater-quality popcorn in 3-5 minutes, is easy to use and easy to maintain. This 20 oz. popcorn machine pops 400 1 oz. servings per hours. This 20 oz. machine also includes a 20 oz. measuring cup for corn, a ¾ cup measuring cup for oil and a stainless steel speed scoop, free with purchase!! Are you looking to buy a high quality popcorn machine? Our popcorn machines help you keep up with the demand and build up a profit foundation whether you a large group or company or a small organization. Our commercial poppers can be used in a variety of locations... from car dealerships, to nursing homes, football stadiums, skating rinks, movie theaters, bars and clubs, little league baseball concession areas, hotels, rental stores, festival locations, and more! You will definitely pop up some handsome profits with our commercial popcorn poppers or create some customer loyalty when your promote your business or dining area with complimentary popcorn! A full line of products and equipment to meet all your popcorn and popcorn machine needs.